Patriot general in American Revolution, was mortally wounded at Germantown, 1777. His home is 150 yds. 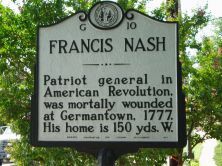 W.
Francis Nash was a General for the Patriot forces in the American Revolution who died in the Battle of Germantown in 1777. Born in Virginia in 1742, Nash moved to what is now Hillsborough by 1763, along with his brother, North Carolina governor Abner Nash. Francis Nash, who worked as a lawyer and merchant, was clerk of court and an assemblyman before the Revolutionary War began, and served as colonel of the First North Carolina Regiment of Continental troops, before being promoted to brigadier general of the North Carolina Continental Troops under General George Washington. Nash lived in Hillsborough until his death, and his house, constructed in 1772, still stands today. In 1771, Nash was falsely accused, amidst the War of the Regulation, of receiving illegal fees as a clerk of court. This led Nash to fight for Royal Governor William Tryon, against the Regulators, at the Battle of Alamance in May 1771. In battle, Nash gained military training that would prove valuable during the Revolutionary War. 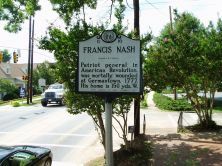 Despite having fought for Governor Tryon in the Battle of Alamance, Francis Nash became a staunch supporter of the Patriot cause. In September 1775, Nash was appointed a lieutenant colonel in the First Regiment of North Carolina Continental troops. Nash quickly gained experience commanding under James Moore in Charleston the winter of 1776-77. In February 1777, the Continental Congress made Nash a brigadier general and, following Moore’s death, Nash became the commander of the North Carolina Continental Troops. Nash died from wounds received during the Battle of Germantown in Pennsylvania on October 4, 1777. Francis Nash was buried near the Germantown battlefield. His wife Sarah and two children survived him, living in the Nash house in Hillsborough until 1782. In 1782 William Hooper, one of North Carolina’s three signers of the Declaration of Independence, purchased the house. Hooper lived in the house until his death in 1790. The Nash-Hooper House was also the residence of North Carolina Governor William A. Graham during the mid-nineteenth century. Nash County, North Carolina; Nashville, North Carolina; and Nashville, Tennessee, are named for Francis Nash.